It would be easy and useful to put the most-commonly-used keyboard shortcut characters (such as ⌃⌥⇧⌘⎋⏏⌫↑⇡↖⇞⇥, and perhaps others — see here for a list, which you can also place at ~/Library/Key Bindings/DefaultKeyBinding.dict to type these characters easily) somewhere on the page (perhaps in the editing help, or discreetly in the footer?) so people could copy and paste them when writing questions/answers if they don't have an easy way to type them. I would love some implementations of this but only if it was clutter free. To avoid overload, perhaps only the symbols that appear as menu items of major apps would be available? I'd leave all the rest out - although a strong case can be made for eject and power symbols since every mac has one or the other in the top right. The list of icons you made is too large for my taste - but I'd rather have too much than nothing at all. Lion does make the special characters feature very easy - but not all our users are on that OS. I can't speak for Linux or Windows users as I don't know how easy the tools for clipping are. I do know that the iPad isn't as easy as you have to either enable the emoji board or bookmark a web app like GlyphBoard and multitask /copy / multitask/ paste your way into these characters. The Markdown Editing Help menu seems an ideal implementation of this. 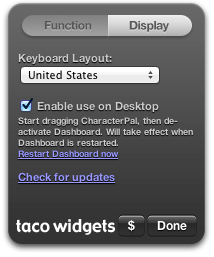 It could ride the coattails of that UI to begin with. It should be fairly trivial to add in a table to the right of HTML - to the left of "advanced help" and drop in a small table that educates users of the current icons in use here. You could place a few characters in the normal drop down - and have a fuller set when you are in the help mode - just like you get basic lists from the toolbar icon, but get advanced nesting help when you look at it with the markdown overlay. And yes, I did copy those symbols to the clipboard by double-clicking on them. I'm in the unfortunate situation of sometimes having to read this site running IE8 on a computer at work when I'm on break. While this post solves the copy/paste problem when I'm away from my Mac, unfortunately, many of the aforementioned characters are just rectangular boxes on my work machine. So perhaps this solution of a copy/paste list will help iPad users, but the special characters are already reasonable accessible on a Mac (but this does make them a little easier to use), and unreadable in some Windows setups, so this solution might be less universally helpful than I might wish it were. Alas. You can actually copy them from this meta post by Dori. She put all the icons, names, and HTML entities into one post. You can just search the post with Command ⌘ + F.
In response to bmike's comment below, this actually will work for those on an iOS device because the meta post above includes HTML entities. While this isn't preferable, it is better than not having them at all. This is the fastest way I know of to find and copy needed characters. Here's one more - an AppleScript. You can customize common selections and make the list pretty much as long as you like. How do you insert keyboard characters into questions/responses? 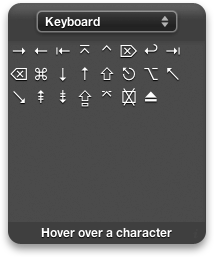 How do I create a keyboard key? Should Civic Duty and Electorate be put between the same hr tags in the Badges list? Can the slug for migrated questions be updated to match the current FAQ? Can I customize the Markdown editor's keyboard shortcuts? New “No Research” close reason?